You know it when you see it, even if someone else might not see the same “it” you do. You know it when it makes you laugh or cry; you know it when you find yourself thinking about it for days and weeks after you first encounter it. It can be tricky and confounding, or it can be disarming in its simplicity. And those who bring it into our lives make it better on a daily basis. Art has always been the stuff of controversy, and a crest on waves of societal change. In a world that seems ever more uncertain and complex, it also feels more necessary than ever. That’s why City Weekly once again honors some of the finest work by local painters, actors, dancers, comedians, writers, craftspeople, filmmakers and more, in addition to the many people who support that work through their efforts. 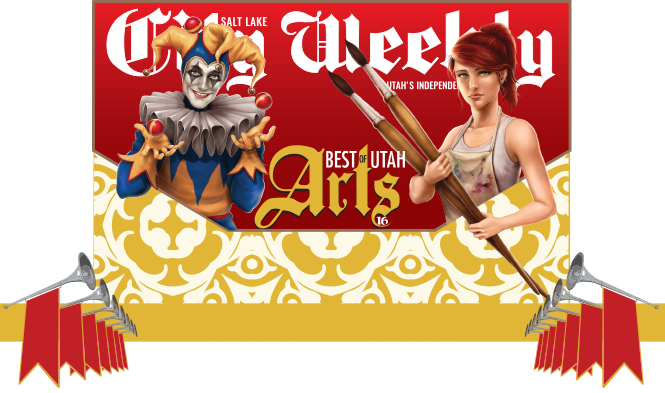 Our readers voted for their choices in a variety of categories, and City Weekly contributors added their suggestions for can’t-miss people and places that make Utah as magnificent a home for lovers of art as for those who create it. No winner or nominee can possibly satisfy everyone; such is the elusive nature of art embodied by the jester on our cover. As we’ve said before, these awards aren’t about ending the conversation. We want to start that conversation, and keep Utah talking about—and supporting—art year-round. 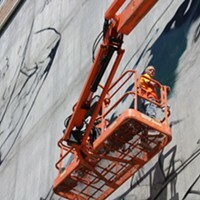 Artist Shae Petersen gets started on his latest project, potentially the largest public-facing mural in the state.